With the bitter cold blowing across the Midwest, The Milk Bank offers a few suggestions on breastfeeding during colder months and the presence of illness. Germs and sickness can be on the rise throughout winter temperatures, which is why it’s important for moms to offer breast milk as much as they are able – even if lactating mothers are sick, their breast milk helps build up much-needed germ resistance that is passed on to babies. Make sure to follow winter weather advisory warnings. If you must go out of the house, keep baby warm by dressing him appropriately – layer a onesie with a sweater or other garment. Don’t forget hats, socks and mittens! This article from the American Academy of Pediatrics is helpful in determining how to keep baby safe and warm while traveling in a car seat. Consider adding layers to your own clothing to stay warm while breastfeeding. Many clothing companies offer accessible options for lactating mothers. Skin-to-skin contact is still beneficial for baby during colder months. Wrap yourselves in blankets to keep each other warm. Keep your breasts warm and loose to prevent milk duct clogs or inflammation. Gently massage your breasts to ease the flow of milk, and avoid tight or restrictive clothing layers. Browse these tips for plugged ducts and mastitis at kellymom.com. It might seem like a no-brainer, but adequate washing of hands is one of the best ways to prevent the spread of germs. Chances are, you’re not doing it enough or as thoroughly as needed. Follow these five steps from the Center for Disease Control & Prevention (CDC). If you are storing breast milk by pumping, it is imperative to keep your pump and its parts clean to avoid contamination, regardless of the time of year. (Contact us if you’re a milk donor and you’d like us to send microwave sanitizing bags to you at no cost!) 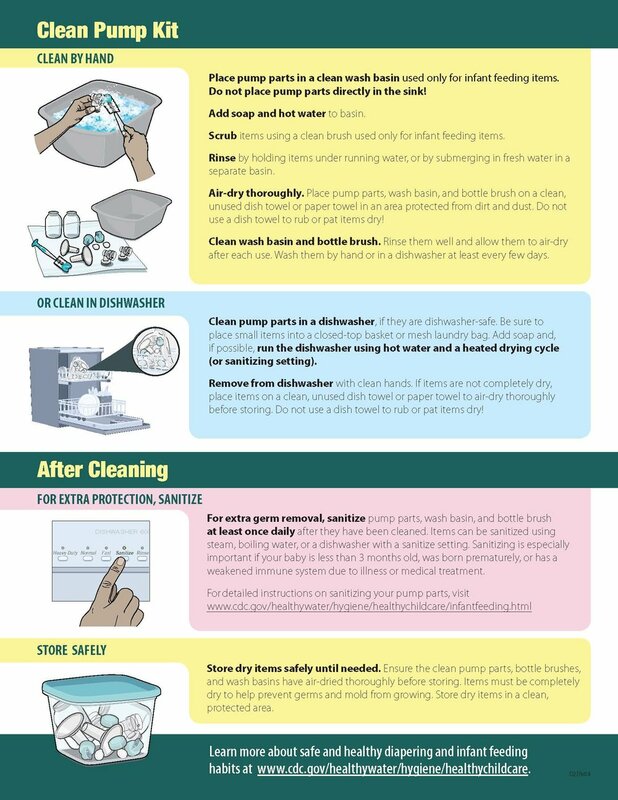 To clean your breast pump, follow these recommended guidelines from the CDC. Are you an active donor mother? Let us know if you or someone in your family is fighting an illness, so that we can guide you through the best process for donating milk during this time. Hunker down, rest up, and enjoy the coziness that winter months can bring to your family!